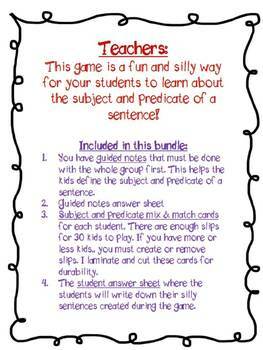 If you are looking for an engaging and fun way to teach your students about subjects and predicates, here it is! 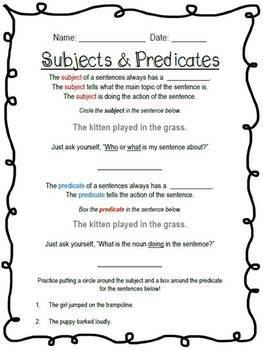 This is also fun for a review if your students have already learned this. 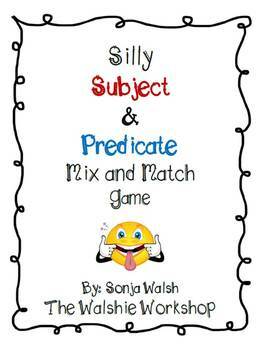 Basically, this is a mix and match card game where half of the kids will have a blue subject card and half will have a red predicate card. They must mix with their opposite color and create a silly sentence with the cards. 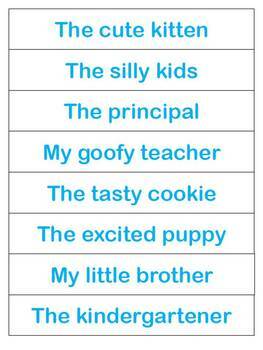 After a good chuckle, the kids will record their silly sentence and get ready to mix and match again with the teacher's signal! This lesson is a lot of fun and my kids always asked if we could play it again! MY favorite part was letting the kids each read their favorite silly sentence at the end of the lesson...we always laughed our heads off!